Michael “The Grinder” Mizrachi of Miami became the first two-time winner of the $50,000 buy-in Poker Players Championship on Thursday night at the Rio in the World Series of Poker, dominating the field to earn $1.45 million. Mizrachi, 31, who won the event in 2010, collected his third career World Series of Poker individual event championship bracelet, and ran his career earnings at the tournament to almost $7 million over 29 in-the-money finishes. The event, considered the tournament’s second-most coveted title after the Main Event, drew a field of 108 competitors. Mizrachi became the first person to have his name engraved twice on the Chip Reese Trophy, named for the late winner of the inaugural event in 2006. The Hard Rock Hotel’s Detox Poker Series, lead by tournament director extraordinaire Matt Savage had four tournaments playing down to a winner on Sunday. The tournament that drew a lot of attention to the live streaming at the Detox Poker site featured a popular member of the poker media making the final table, but a former WPT winner who held all the chips in the end. The final day of the $100,000 Guarantee $350 NL Holdem started with 18 players quickly making their way to a final table, which featured Bluff/WPT/Poker Beat reporter Jess Welman and 2006 WPT Mandalay Bay Championship winner Joe Tehan. Welman took her short stack into an 8th place finish, earning $3,140. Tehan maintained his chip lead until a deal was made three-handed, with Tehan collecting $31,943. The full results of the final table can be found here. Event #3, the $350 HORSE wound up with Benjamin Yu and Colby Pitt making a deal heads-up with Yu earned the victory and $5,930. While Pitt was runner-up, he won more money, collecting $6,168. Full results available here. Event #4, the $350 NL Bounty tournament, drew a field of 60 players, each with a $100 bounty on their head. Kent Frampton started heads-up down 5 to 1 in chips against Veerachai Vongxaiburang, eventually picking up the win good for $5,040 while Vongxaiburang earned $2,640. Blake Bluffington finished 3rd for $1,680 and Sam Grizzle finished 4th, earning $1,200. Full results and a winner’s photo here. A field of just 28 participated in event #5, Scott Fischman 7-Game Mix with James Wheatley earning the title for $4,620. Brian Kim was runner-up for $2,520, Ryan Hullerman finished 3rd for $1,260. Two more tournaments on the schedule, starting at 1pm with event #6, $350 NL Holdem, while at 5pm it’s Event #7, $350 Pot-Limit Omaha 8 or Better. Be sure to check out DetoxPoker.com for updates, interviews and streaming video. Saturday was a busy day for the Detox Poker Series, with day 1b of the $335 NL Holdem $100,000 Guarantee, the final table of the $350 Omaha 8 or Better event, and the opening day of the $350 HORSE. Day 1b drew a field of 193 entrants, creating a total prize pool of $121,150 with the remaining 18 players Saturday making the money, with the final nine joining the nine survivors from Friday to play down to a winner at 3pm. Joe Tehan leads the field of day 1b survivors with 288,000 in chips. The other notable from day 1b returning this afternoon is Bluff Magazine/World Poker Tour/The Poker Beat Jess Welman, finishing with 75,500 in chips. Here’s how the final two tables will be seated with 19:42 remaining in level 16: 1,500/3,000 with a 500 ante. The final 18 are guaranteed at least $1,050, with the winner pocketing $34,440. The full list of payouts and players who cashed can be found here. Frankie O’Dell, winner of two WSOP bracelets in Omaha 8 or Better, added another tournament win to his results as he defeated Mitch Schock heads-up. The pair made a deal with O’Dell earning $6,000 with Schock earning $4,944. The rest of the results are available here. Two more tournaments get underway today, at 1pm is the $350 NL Holdem Bounty tournament, with $100 bounties on every player’s head. The 5pm tournament is the $350 Scott Fischman 7 Game Mix event, consisting of HORSE, NL Holdem and Pot Limit Omaha. Be sure to check out Detox Poker and Quad Jacks for video, updates, interviews, and much, much more. A reminder that day 2 of the WSOP Tournament of Champions resumes shortly after 12pm PT this afternoon. ESPN3 will be streaming the action with 22 players remaining as they play four more levels before concluding the action on July 4. To see how the field stands and get updates for those unable to watch, head to wsop.com. The final hand of the $1,500 No-Limit Holdem event may have brought delight to some poker bloggers, as Jesse Rockowitz held the suited hammer (7h-2h), flopping two pair against Ray Coburn. Coburn turned a straight draw, but the river was of no help, giving Rockowitz the bracelet along with $721,373 for his victory. Coburn was resigned to collecting $446,274 from the cashier for the runner-up finish. Full results along with Nolan Dalla’s tournament report at wsop.com. Chris Bell, good friend of recent bracelet winner Gavin Smith, won a bracelet of his own, defeating Dan Shak in a lengthy heads-up battle to win the $5,000 Pot-Limit Omaha 8 or Better bracelet along with $327,040. Shak earned $202,142 for the runner-up finish, with David “Devilfish” Ulliott third for $150,925. Erik Seidel concluded his lengthy day after playing the Tournament of Champions by finishing in 5th for $85,800. Full results and Dalla’s report at wsop.com. Day three of the $2,500 Mixed Event begins at 3:00pm today with Nikolai Yakovenko (310,000) leads the remaining 20 players in the field. Other notables returning include Matt Vengrin (276,600), Kirk Morrison (214,900), Scott Seiver (197,700), Alexander Kravchenko (178,100), Dario Minieri (145,600), Todd Brunson (101,400) and John D’Agostino (60,600). Full chip counts and updates during the afternoon at wsop.com. Day 2 of the $1,000 No-Limit Holdem gets underway at 2:30 this afternoon with around 445 players returning to the Rio as they first reach the money when they reach 324 players, then try to get close to a final table, although that’s unlikely. The leader of the final 188 players who survived at the end of day 1b remains Ben Klier with 65,675. Other notables from day 1b: Pokerati fave Richard Ferro (64,375) Olivier Busquet (59,100), Jeff Madsen (43,000), Chris Moneymaker (41,125), Terrence Chan (29,200), David Sklansky (23,850) and Faraz Jaka (17,700). For Team Pokerati followers, John Harris finished with 12,425, Full chip counts now available at wsop.com. Two more tournaments get underway this afternoon, starting with the seventh and final $1,500 No-Limit Holdem tournament of the WSOP. Last year’s winner was Tony Veckey, who defeated a field of 2,818, winning $673,276 for his only career cash. The 5pm tournament is the $5,000 Pot-Limit Omaha, won by Richard Austin last year for $409,484 in besting a field of 363. Recapping Saturday night’s action, with the list of great players without a bracelet had another named crossed off the list. Day three of the $1,500 No-Limit Holdem returns at 3:00pm with Sam Trickett (922,000) leading the 35 players remaining as they play down to a winner. Other notables in the hunt include: Dutch Boyd (619,000), Ray “ExitOnly” Rayburn (560,000), Paul Magriel (460,000), Alex Outhred (444,000), and Zachary Clark (176,000). Team Pokerati’s Tom Schneider finished 128th, good for $4,348. Full chip counts available at PokerNews. Day 3 of the $5,000 Pot-Limit Omaha 8 or Better resumes at 3pm with Sergey Altbregin (486,000) holding the chip lead with 21 players remaining. Other notables returning: David “Devilfish” Ulliott (415,000), Perry Green (367,000), Dan Shak (331,000), Dan Heimiller (247,000), Allen Kessler (117,000), Andy Black (100,000) and Erik Seidel (65,000). 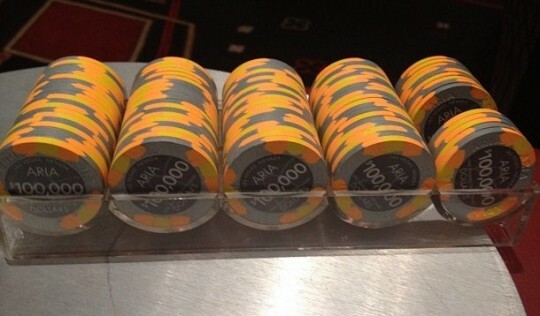 Full chip counts and updates available at http://www.pokernews.com/live-reporting/2010-wsop/event-46/“>PokerNews. The next to last $1,000 No-Limit Holdem event of the WSOP drew a field of 1,759 entries for day 1a Saturday afternoon. That field was whittled down to around 300 players when they return on Monday afternoon, and the reported leader is Justin Brickner with 86,000 in chips. Other notables include Antonio Esfandiari (35,000), Scott Montgomery (30,000), Matt Glantz (28,000) and Carter King (17,000). Full chip counts along with updates for Sunday’s day 1b action available at wsop.com. Day one of the $2,500 Mixed Event brought 453 players to the Rio Saturday afternoon, with 162 returning at 4:10pm today. The reported chip leader is Jared Jaffee with 71,125. Some of the notables returning include: Justin “Boosted J” Smith (58,225), Michael Mizrachi (56,875), Brandon Cantu (41,000), Scott Seiver (37,350), Dario Minieri (32,175) and Gavin Griffin (29,150). Team Pokerati’s Julie Schneider returns with 18,975 in chips. Other chip counts and updates at wsop.com. Dean Hamrick, who bubbled the 2008 WSOP final table, earned his first WSOP bracelet as he defeated Thomas O’Neal heads-up in event #42: $1,500 No-Limit Holdem winning $604,222 and his first WSOP bracelet. O’Neal earned $375,627 for finishing 2nd, while UFC fighter Mike Swick finished in 10th. Full results online at wsop.com. With nine players remaining, Ian Gordon was the least-known name of a star-studded final table in the $10,000 HORSE World Championship. That face didn’t stop him as he was the last player with chips on a lengthy final day, denying Richard Ashby his second WSOP bracelet, winning $611,666 and a coveted WSOP gold bracelet. Ashby earned $378,027 for finishing 2nd, while Eugene Katchalov finished 3rd for $248,831. Full results at wsop.com. Day 1 of Event #45: $1,500 No-Limit Holdem completed their first 10 hours with less than 400 players remaining, with the final 324 in the field making the money, while the winner adds $721,373. The reported leader is Will Failla with 156,000 in chips. Other notables returning at 2:30 include Veronica Dabul (70,000), Alex Outhred (65,000), John Phan (58,500), Amnon Filippi (47,000), Lauren Kling (29,000) and Team Pokerati/Loudmouth Poker pro Tom Schneider (25,900). Full chip counts available at PokerNews. Day 2 of the $5,000 Pot-Limit Omaha 8 or Better resumes at 3pm with 130 of the 284 players who started remaining. The chip leader is Colin Burton with 91,700. 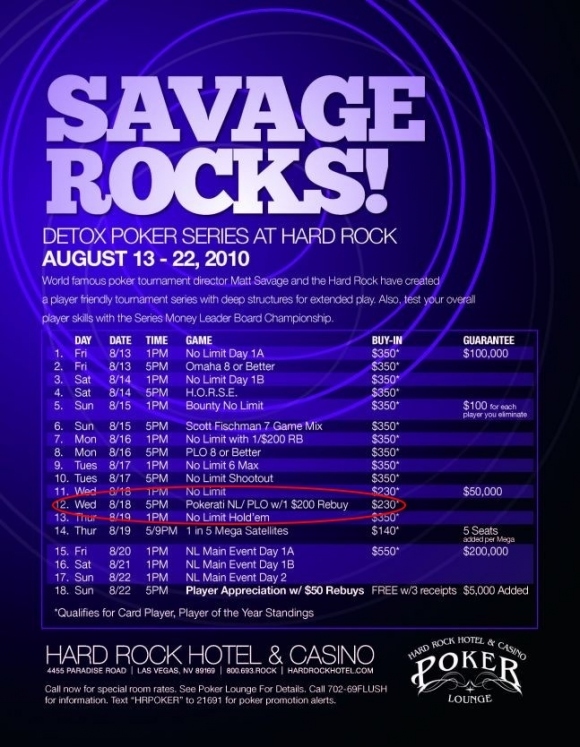 Other notables include James Dempsey (88,900), Mike Matusow (63,100), Scott Seiver (44,000), Annie Duke (39,900), Dave Ulliott (36,000), Tony Cousineau (29,000), and Annie Duke (23,000). Full chip counts available at PokerNews. The 12pm tournament is day 1a of the fifth $1,000 No-Limit Holdem with the usual throng of thousands expected to turn up. The 5pm tournament today is the $2,500 Mixed Event, consisting of HORSE, No-Limit Holdem, 2-7 Triple Draw Lowball and Pot-Limit Omaha. Last year’s winner of this event was Jerrod Ankenman defeating a field of 412, earning $241,637. As the California State Poker Championship rages on at the Commerce (with cool trophies, gotta say), tournament director Matt Savage’s return to Vegas for an LV Poker Series at the Hard Rock has taken final shape. The series itself will now be called the Detox Poker Series. And Event #12 will be Pokerati NL/PLO. It’s a $230 no-limit hold’em / pot-limit omaha event, with a single $200 rebuy. 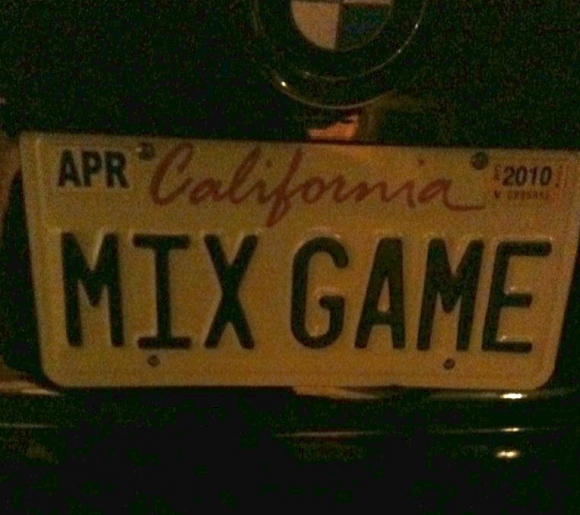 Gee, sounds like a typical night for yours truly at the Pokerati game. Takes place at 5 pm on Wednesday, August 18. It’s not often a WSOP Circuit event catches our eye, particularly when the final table is fighting for the lion’s share of a $20k prizepool. But Event #10 in New Orleans, the last Circuit stop of the 09/10 poker year, was special, as Daphne “Tweety” Turner beat Allen Kessler to win the $300+40 Mixed Games event. Big players are (back) in Las Vegas … low Festa al Lago prelim field sizes suggest nothing is as it was a couple years ago, but the higher-stakes action is moving at Bellagio … or at least arriving there. Drinking Dom in VIP booth with wife. Trapeze stunt from 5 stories up at 10:40 pm…Scary! I am pretty drunk!! Chris Ferguson just called me and told me they picked me up in 2-7 tourney!! 15,200 extra chips are in play going into Day 2 of the $2,500 2-7 Triple Draw — roughly a third of which belonged to no-show Phil Hellmuth before tournament officials removed his remaining stack (in level 5) and refunded his late buy-in. Hellmuth bought into WSOP Event #55 by proxy — presumably near the last possible minute — with his 7,500 starting stack brought to the felt shortly before the end of the break between levels 2 and 3. His seat in the Brasilia Room remained empty for hours as he attended a much-ballyhooed Ultimate Bet party at Studio 54 in the MGM. Hellmuth’s stack had been blinded down to about 2,500 when the event TD approached Chris Ferguson, who was playing, and asked if he had Hellmuth’s phone number. Ferguson did, and the TD called but got no answer. So he then called his supervisor, who apparently instructed him to remove Hellmuth’s chips from play. Shortly thereafter — in Level 5 still — the number of entrants on the screen was reduced from 258 to 257, and prize payouts were downgraded accordingly. At the end of Day 1, the 73 remaining players bagged a total 1,942,700 chips, even though the appropriate number for 257 players in a $2,500 event would be 1,927,500. 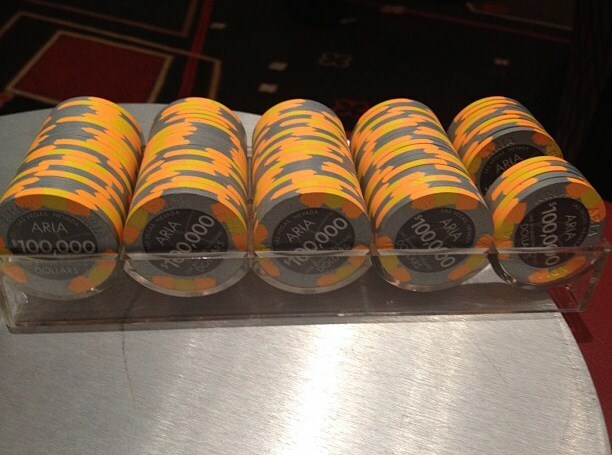 No word yet on where the 10,000 chips that didn’t belong to Phil Hellmuth came from. Click here to follow the action in $2,500 2-7 Triple-Draw when play resumes at 2 pm pacific. Plenty of interesting big-name pros and 2009 bracelet winners still in the hunt — Negreanu, Ankenman, Sung, Mueller, among them — along with a few dozen lesser known mixed-games grinders … all competing for a $166k $165k bracelet.